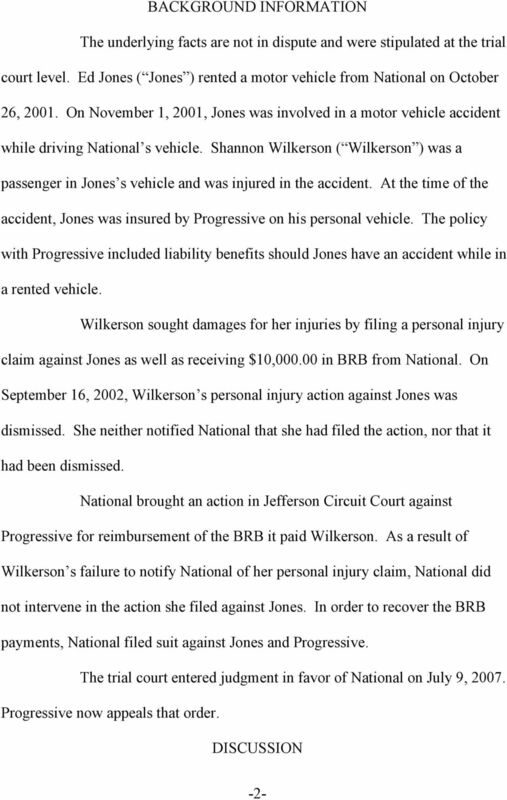 Download "Commonwealth of Kentucky Court of Appeals"
1 RENDERED: MAY 8, 2009; 10:00 A.M. NOT TO BE PUBLISHED Commonwealth of Kentucky Court of Appeals NO CA MR PROGRESSIVE MAX INSURANCE COMPANY APPELLANT APPEAL FROM JEFFERSON CIRCUIT COURT v. HONORABLE GEOFFREY P. MORRIS, JUDGE ACTION NO. 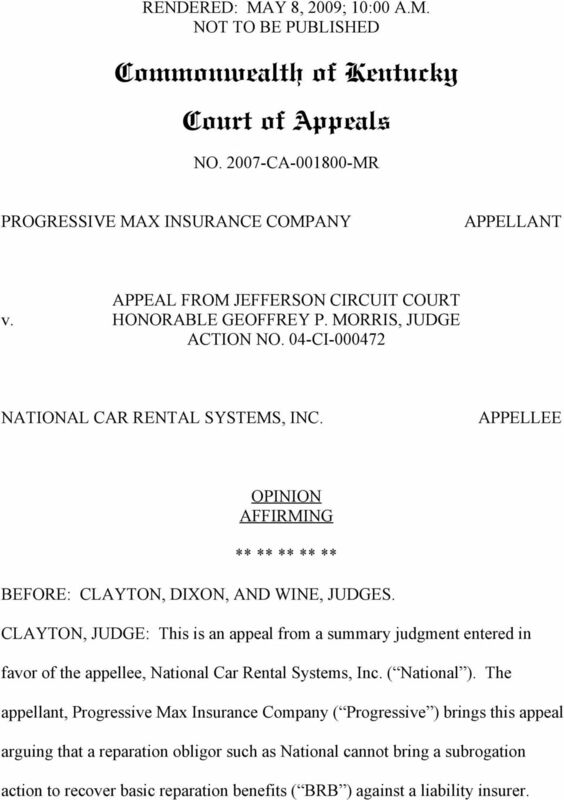 04-CI NATIONAL CAR RENTAL SYSTEMS, INC. APPELLEE OPINION AFFIRMING ** ** ** ** ** BEFORE: CLAYTON, DIXON, AND WINE, JUDGES. CLAYTON, JUDGE: This is an appeal from a summary judgment entered in favor of the appellee, National Car Rental Systems, Inc. ( National ). 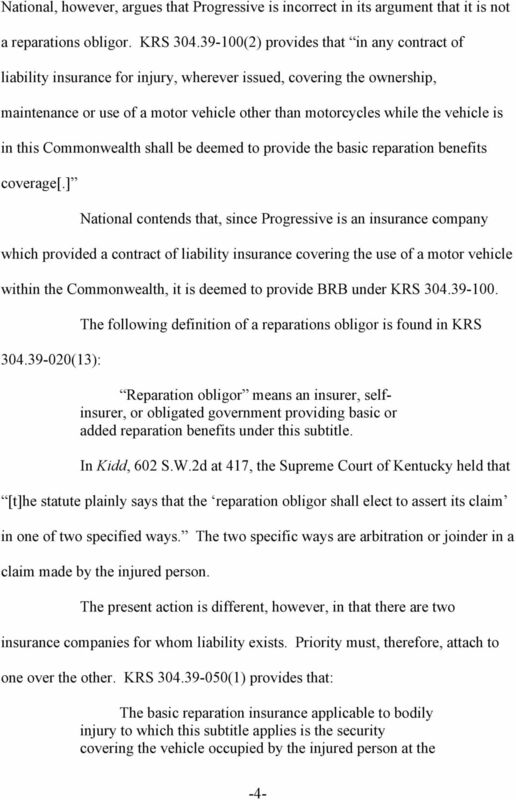 The appellant, Progressive Max Insurance Company ( Progressive ) brings this appeal arguing that a reparation obligor such as National cannot bring a subrogation action to recover basic reparation benefits ( BRB ) against a liability insurer. 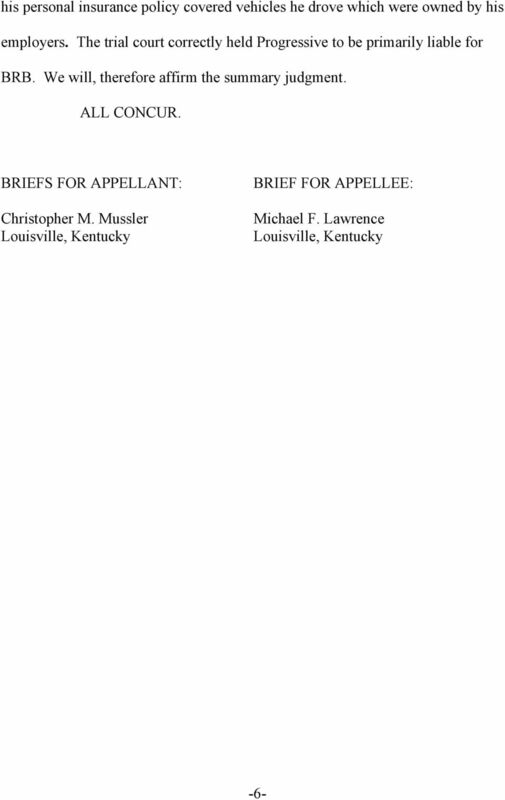 RENDERED: OCTOBER 12, 2012; 10:00 A.M. TO BE PUBLISHED Commonwealth of Kentucky Court of Appeals NO. 2011-CA-001454-MR TAMRA HOSKINS APPELLANT APPEAL FROM LINCOLN CIRCUIT COURT v. HONORABLE JEFFREY T.
RENDERED: NOVEMBER 5, 2010; 10:00 A.M. TO BE PUBLISHED Commonwealth of Kentucky Court of Appeals NO. 2009-CA-001056-MR WENDY W. BURTON APPELLANT APPEAL FROM HARLAN CIRCUIT COURT v. HONORABLE RUSSELL D.
COURT OF APPEALS OF WISCONSIN PUBLISHED OPINION PLAINTIFF-APPELLANT, DEFENDANTS, DEFENDANTS-RESPONDENTS. 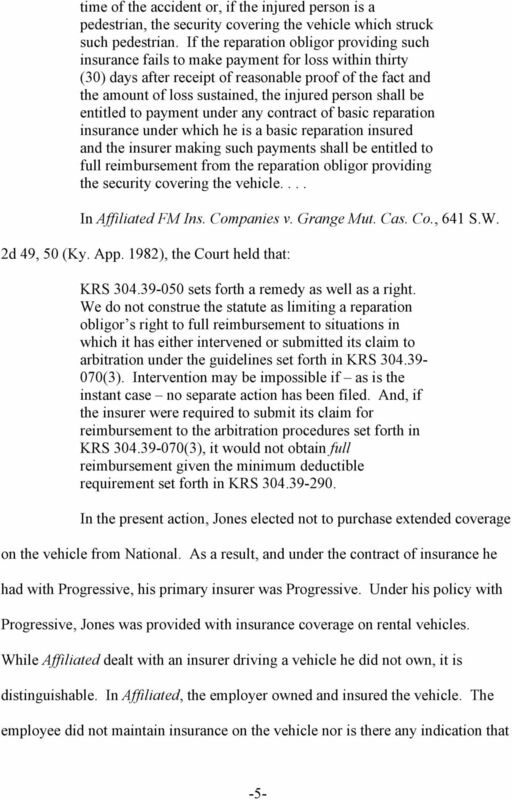 HARRIS v AUTO CLUB INSURANCE ASSOCIATION. Docket No. 144579. Argued March 6, 2013 (Calendar No. 7). Decided July 29, 2013. COURT OF APPEALS OF WISCONSIN PUBLISHED OPINION PLAINTIFFS-APPELLANTS, DEFENDANT-RESPONDENT, DEFENDANT. Present: Carrico, C.J., Compton, Stephenson, * Hassell, Keenan and Koontz, JJ. SUPREME COURT OF LOUISIANA NO. 97-C-0416 PAUL B. SIMMS JASON BUTLER, ET AL. IN THE COURT OF COMMON PLEAS FIRST JUDICIAL DISTRICT OF PENNSYLVANIA TRIAL DIVISION CIVIL SECTION LOUISE FOSTER Administrator of the : AUGUST TERM 2010 Estate of GEORGE FOSTER : and BARBARA DILL : vs. RENDERED: FEBRUARY 6, 2015; 10:00 A.M. TO BE PUBLISHED Commonwealth of Kentucky Court of Appeals NO. 2009-CA-002378-MR MICHAEL JOSEPH FLICK APPELLANT ON REMAND FROM THE KENTUCKY SUPREME COURT CASE NO. Illinois Official Reports Appellate Court Acuity v. Decker, 2015 IL App (2d) 150192 Appellate Court Caption ACUITY, Plaintiff-Appellant, v. DONALD DECKER, Defendant- Appellee (Groot Industries, Inc., Defendant). STACKING UP: UNDERSTANDING AUTOMOBILE INSURANCE COVERAGES The Missouri Bar Solo and Small Firm Conference June 14, 2013 Sidney Eckman Wheelan Tatlow, Gump, Faiella, and Wheelan, LLC 1 48--1 WHAT IS STACKING? 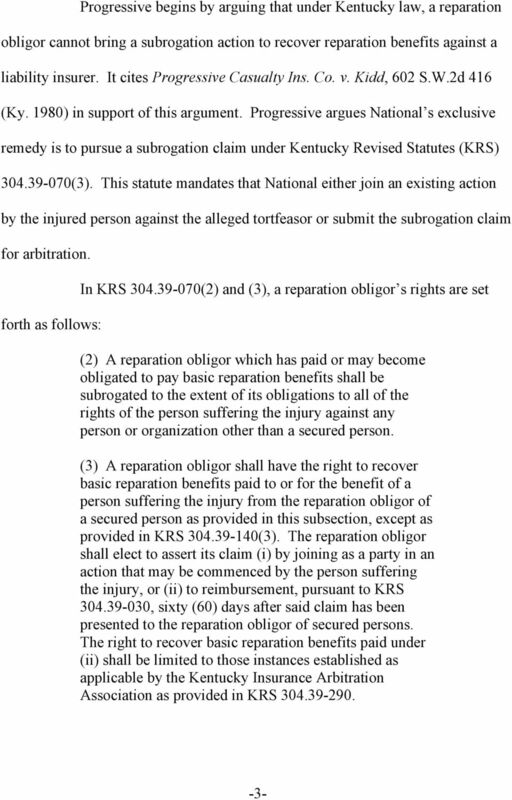 RENDERED: DECEMBER 2, 2005; 2:00 P.M. NOT TO BE PUBLISHED Commonwealth Of Kentucky Court of Appeals NO. 2004-CA-002130-MR BETTY HUNSAKER AND PEGGY GREER APPELLANTS APPEAL FROM LETCHER CIRCUIT COURT v.